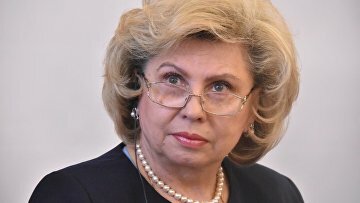 Russia’s Ombudsman appeals to UN Rights Commissioner over journalist detained in Ukraine | Russian Legal Information Agency (RAPSI). MOSCOW, March 5 (RAPSI) – Tatyana Moskalkova, Russia’s Ombudsman, had handed to Michelle Bachelet, the United Nations High Commissioner for Human Rights, a letter in defense of Russian journalist Kirill Vyshinsky detained in Ukraine on treason allegations, Moskalkova’s press-service told RAPSI on Tuesday. The letter was given to the UN official during Russia’s Ombudsman official visit to the UN Geneva office, where she met the High Commissioner. According to Moskalkova, Vyshinsky was not involved in any unlawful activities and just performed his duties as a journalist, and even in spite of his poor health the Ukrainian competent authorities refuse to replace his detainment with house arrest. Russia’s Ombudsman voiced a hope that Michelle Bachelet would pay attention to the journalist’s situation and provide assistance in an independent investigation of his case. Moskalkova also called the High Commissioner’s attention to a tragic death of a Russian citizen in a Ukrainian prison, his relatives believed to be not an accident. In the course of the meeting, the Russia’s Rights Commissioner defined the Ukrainian travel ban on Russian male citizens aged from 18 to 60 as an unprecedented measure, and informed the UN official about Ukrainian citizens residing in Russia complaining that they would not be able to take part in the Ukrainian Presidential elections due to the refusal of the Ukrainian authorities to open ballot stations in Russia. 16:01 05/03/2019 Tatyana Moskalkova, Russia’s Ombudsman, had handed to Michelle Bachelet, the United Nations High Commissioner for Human Rights, a letter in defense of Russian journalist Kirill Vyshinsky detained in Ukraine on treason allegations.